Con/ sound. 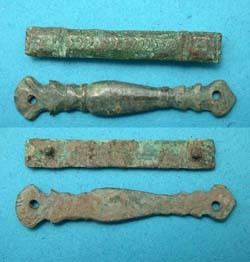 The upper enamling has been degraded, the lower is completely intact. Ref/ Compare our seal box with # 4967 in the link below. "The Romans used many locks for many purposes, as we do. There were door locks, chest locks and padlocks in great variety, but there were situations in which it was awkward to use any of these. Bags of newly minted coins were shipped to and from the provinces. Shipments of goods in fabric or leather containers needed some sort of protection. And then there were letters. Then as now, government officials, politicians, merchants and especially military commanders needed to send messages, sometimes very urgently. For state business, at least, this was done by an ancient version of the pony express, the Cursus Publicus: a system of relays of couriers traveling the famous Roman roads. There was, however, a security problem: no one but the recipient could be allowed to read sensitive information. Messages were usually written with a stylus on wood tablets, surface-coated with wax (Curle). But how do you make sure that no one reads them but the recipients? How do you know that a bag hasn’t been opened and a few goodies stolen? One solution to these problems was the seal box. This was a little bronze box, generally an inch or so in size, with holes in the side and bottom. For fabric and leather containers, it was attached by sewing through the holes in the bottom. Message tablets were probably bagged. Containers were bound with cord passing through the holes in each side and tied with a knot inside the box. The box was then filled with wax, impressed with the sender’s seal and closed. Of course containers could still be opened and the contents read or stolen, but there would be severe consequences! Boxes have been found with traces of wax inside (Wikipedia) and there is one such in this collection. A sketch of the packaging scheme for message tablets is shown at right, from Holmes. It seems very strange from our point of view, that of a mechanical civilization with billions of such little objects, but seal boxes were rare and important items. They were lost wax castings made with considerable labor and expense. They were often elaborately decorated and some were even finished with colored enamel, some examples of which are shown here. Figural designs were most impressive, but of course more expensive. The embossed phallus was popular, as were animal figures. I haven't found any details of their manufacture and distribution, but the casting in bronze would be pretty straightforward. Roman smiths were very skillful.. The seal box seems to have been a peculiarly Roman invention and as an artifact of their civilization, did not survive them." Rare and very collectable...and probably way underpriced.